57 ways to get more repeat bookings from existing customers – to generate more profit for your hotel. 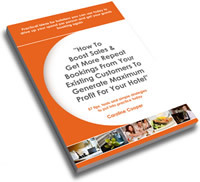 Caroline Cooper – author of Hotel Success Handbook – shares some great tips in this FREE report. To download the report just visit www.GetMoreHotelBookings.com and fill in your name and email address and you’ll have access to all the 57 tips. How to drive your existing and potential customers back to you – time and again. How to increase customers’ spend per head and increase the lifetime value of every customer. Why you need to collaborate with suppliers, local businesses and even your competitors for a win – win. How to ensure your staff are contributing to – not hindering – your efforts to increase margins.